Discover Scuba Class are held Saturday. All participants must call and register for the class. Class will be held at Blu Water Scuba Aquatic Center 9446 Taney Road, Manssas, VA 20110. Class time is 9 AM. Please arrive 10 minutes before class time to do the paper work and get fitted for gear. All participants must sign releases and under 18 must have legal guardian sign the release. Click here for the medical release form, please read before coming to the class, if you answer yes to any question on the form you must have your Doctor sign the form giving you permission to do scuba diving. Please be advised that we have a 72 hour cancellation policy once your register for the class. If you have any questions please call the store (571) 379-7000. There is nothing like breathing underwater for the very first time. 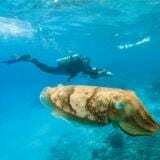 It takes a little getting used to – after all, human beings weren’t designed to do that – but after a few mintes of awestruck wonder, most participants realize how easy scuba diving really is. The biggest challenge instructors have with the Discover Scuba Diving program is not coaxing participants into the water, but coaxing them out when the program is over. The fun part? It’s all fun! Breathing underwater for the first time is thrilling, so don’t wait. Download the PADI Discover Scuba® Diving Participant Statement (pdf). Sign up for Open Water Diver Online and to start your training to become a certified diver. 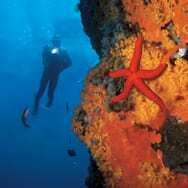 Enroll in a PADI Open Water Diver course. Read the scuba certification FAQs (Frequently Asked Questions). Full SCUBA Unit (BCD with weight belts or pockets, wetsuits, regulators, tanks, and weights). Students are responsible for providing their own personal scuba gear (mask, fins, snorkel, and wetsuit boots). Camp-n-Dive or Trip fees not included. For the open water certification dives we use the Rappahannock Quarry as our local quarry every month from April thru October. Once a month we go to Dutch Springs (a scuba park in Pennsylvania) and once a month we go to Lake Phoenix in Rawlings VA. Known as our camp and dive weekends. During the colder months (November – March) we run warm water trips to Florida and the Caribbean for students to complete their training. Alternatively, students can compete the first two parts of their training with us and then get a referral to take to another PADI operation worldwide. Check our calendar in the store or on our website for exact dates and times. Advanced Open Water Diver course is all about. And no, you don’t have to be “advanced” to take it – it’s designed so you can go straight into it after the PADI Open Water Diver course. The Advanced Open Water Diver course helps you increase your confidence and build your scuba skills so you can become more comfortable in the water. This is a great way to get more dives under your belt while continuing to learn under the supervision of your PADI Instructor. This course builds on what you’ve learned and develops new capabilities by introducing you to new activities and new ways to have fun scuba diving. It all starts with e-Learning followed by you open water dives. Sign Up Now! 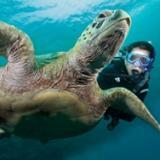 your instructor choose from 15 types of Adventure Dives to complete your course. You can try your hand at digital underwater photography, wreck diving, diving with underwater scooters, peak performance buoyancy and much more. You use all the basic scuba gear including your underwater compass. Depending on which three adventure dives you pick, you may also try out underwater photography equipment , DPVs (underwater scooters), a dive light a dry suit, lift bags, a dive flag/float or other specialty gear. Check with your local dive shop about gear rentals and packages offered with this course. You can find most everything at the scuba diving shop. PADI’s Adventures in Diving Manual and DVD provide information on more than 16 types of specialty diving.You’ll use them as a guidebook to improve your diving skills and prepare for new experiences and adventures. Dive more challenging dive sites while you satisfy your curiosity for “I wonder what’s down there?” The fun part about altitude diving is that you can explore places many people have never seen. As you learn about fish survey techniques you may also want to work on a conservation project as part of your PADI National Geographic Diver certification. Gain the knowledge and skills to explore caverns correctly and safely. This course guides you to enter far enough for adventure, but stay within the light zone for an easy exit to open water. Caverns exist in many areas where scuba divers venture – from freshwater springs to volcanic island walls and limestone coasts. In these locations you’ll find large, dark spaces that seem incredibly inviting, yet are potentially dangerous. The PADI Cavern Diver Specialty course gives you the knowledge and skills to explore caverns correctly – allowing you to enter far enough for adventure, but staying within the light zone for an easy exit to open water. You need to be PADI Advanced Open Water Diver who is at least 18 years old to enroll in the Cavern Diver course. Other specialized equipment for cavern diving, such as lights and redundant breathing systems. Avoiding disorientation and anti-silting techniques. Dive planning, including depth and distance limits and air management for cavern diving. Along with your basic scuba equipment, you’ll need a primary dive light and a smaller backup light, plus a line and reel. Your PADI Instructor may suggest other gear appropriate for cavern diving, such as a collapsible snorkel that fits in your pocket or other technical diving equipment. Visit our retail center or click the registration button below to enroll in the course and schedule the first class session with your PADI Instructor. It’s a great way to relive the adventures you’ve had. Plus capture images to share with your friends and family. 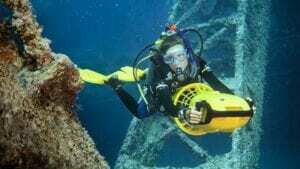 Of course, you’ll need a DPV along with your basic scuba equipment. If you have your own DPV, your instructor will have you complete all your training using it. Ask your PADI Instructor or our staff which DPVs are available, and what other additional equipment you may need for your scuba diving exploration with a DPV. Safety considerations when using oxygen. Visit our retail center to enroll in the course and get your PADI Emergency Oxygen Provider Manual. Read the manual before class as directed by your instructor in preparation for skill practice. Your PADI Instructor will have emergency oxygen units available to use for training for your class. If you wish your instructor can help you purchase your own unit for use after the class. You’ll also need to have a non-rebreather mask to use during practice sessions, if you don’t have one they are available for purchase in our retail center. Browse the Blu Water Course Catalog and check out related courses, such as PADI Rescue Diver and Emergency First Response. To purchase this course Start Here! The classroom session covers equipment orientation, analyzing oxygen content in a scuba tank, setting a dive computer with enriched air nitrox & knowledge review along with finalizing paperwork. Learn to manage basic scuba diving equipment repairs and adjustments. Understand routine care and maintenance procedures and how dive gear works. Don’t miss a dive due to minor issues with your scuba diving equipment. Whether it's a missing o-ring, wetsuit tear or a broken fin strap, the PADI Equipment Specialist course teaches you to manage basic repairs and adjustments. You'll also learn more about how your gear works, making you more comfortable with it and better prepared to take care of your investment. Visit our retail center or click on the button below to enroll in the course and get The Encyclopedia of Recreational Diving to use as a reference during the course. Explore the unique aquascape found only under ice. You can be one of the few that have ever dived under a solid ceiling of ice. Plus, imagine the look on your Divemaster’s face on your next Caribbean trip when you flash your PADI Ice Diver certification. You might get a chance to play with your exhaled air bubbles on the bottom of the ice or an opportunity to try the unique sport of upside down, bottom of the ice, skiing. Extend your underwater time, learn what multilevel diving is and how to calculate for multilevel dives. 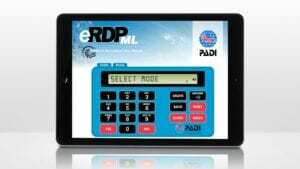 Plan and execute a two-level and three-level scuba dive using the eRDPML . Besides your basic scuba equipment, you’ll want to have your own dive computer and a slate to record dive information. Ask our staff what additional equipment you may need for your multilevel scuba dives. Stop by our retail center to sign up for the course, and purchase your eRDPML and Instructions for Use booklet. Start learning to use this multilevel dive planner on your own before meeting with your PADI Instructor. Start the course online or stop by the dive shop. If you prefer, you can choose to study with the Rescue Diver Manual and watch the Rescue Diver Video (a book and DVD package). Stop by the store to enroll in the course, get your materials and start learning. Your PADI Instructor will meet with you to schedule knowledge review sessions along with your rescue exercises and scenarios. Sign up for Rescue Diver Online and start learning right away. Download a PADI Medical Statement and Questionnaire (https://apps.padi.com/scuba-diving/elearning/?irra=22021pdf). Rescue Diver Online gets you started right away and let’s you learn at your own pace and in your own time. To purchase this course and attend our class session Start Here! Has it been a while since you’ve been scuba diving? Do you feel like your scuba skills and knowledge are a bit rusty? The Scuba Review Tune-up is just the refresher you need. It reacquaints you with diving so that you’re back to feeling comfortable in the underwater world in less than a day. You use all the basic scuba gear. 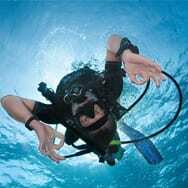 What are the five steps in a pre-dive safety check? What is the maximum depth limit for all recreational diving? What are the signs and symptoms of decompression sickness? At 12meters/ 40 feet a diver runs out of air. Her buddy is more than 60 feet away, what should she do? Correct answers will allow you to complete the book quickly. For incorrect answers, you’ll read a brief explanation to help you understand the concept. The PADI Sidemount Diver Course is designed to train certified divers how to safely utilize side-mounted primary cylinders as an alternative to the traditional back-mounted configuration. We offer Sidemount certification as a standalone course, or it can be combined with any specialty certification as a training option. Sidemount originated with cave diving, basically to get cave divers in to spots they were unable to go with back mounted tanks. The smaller profile allowed travel through some passages (or “restrictions”) that could not be traveled before. But why would recreational divers be interested to go to a side mount configuration, over the traditional back mount? There are many benefits to the side mount configuration that can be applied to even the most basic recreational diver; we’ll cover some of those benefits here. Ability to fully reach and manipulate valves and regulators. What was once difficult to control and reach behind the shoulder, is now right in front of you. Completely independent tanks and therefore gas supply. There is no one failure that will eliminate more than 1/2 of your remaining gas. No entanglement areas are behind your back. Think about wrecks that you could be exploring with dangling ropes and fishing nets that can snag on a backmounted tank. Sidemount configurations can be completely customized to fit an individual, and they can be used for all forms of advanced diving such as with wrecks, technical, and caves. Easier to carry tanks to the water, for fills, etc. This can be especially beneficial for those with injuries or disabilities where the weight of a backmounted tank(s) can be a stress, or simply impossible on long or steep walks. Sidemounted tanks can be carried to the water separately, and then just attached to the harness in the water. Travelling divers can use any set of rental tanks without changing their configuration. What are the Benefits of Sidemount Training? As sidemount seems like just an alternate tank configuration option, you may wonder why specialty training is even required for it. However there are several key benefits to formal training for even the most experienced divers. Information about specialized sidemount systems available today, configuration options, optimal adjustments for fit and trim. Learn and practice the skills required to manage the gas supply using separate primary cylinders. Learn and practice skills required to dive with mixed teams (sidemount and backmount). Learn and practice emergency procedures using the sidemount configuration. Your instructor has the benefit of experience diving the sidemount configuration, and can share tips and best practices that will benefit you! PADI OW Diver or have a qualifying certification from another training organization. Complete 4 side mount open water dives (no more then 3 dives per day). First OW Dive not to exceed 10 meters/30 feet, with all subsequent dives not to exceed 30 meters/100 feet. Exposure suit appropriate for local diving environment and depth (dry suit or wetsuit). Hood, boots and gloves or mitts, if needed. Quick-release weight belt or weight system, if needed. Complete instrumentation, including a means to monitor depth, time and direction. Diving tool or knife capable of cutting line. Whistle or other surface signaling device. Day 1 – Classroom theory, equipment workshop and skills training. The primary difference between rebreathers and open-circuit units is that rebreathers reuse some or all of the gas you exhale. There are two basic types of rebreathers: closed-circuit rebreathers (CCRs) and semi-closed rebreathers (SCRs). The PADI Rebreather and Advanced Rebreather Diver courses use Type R units to introduce divers to rebreather diving within recreational dive limits. Type R rebreathers are electronically controlled and provide a back up for all the major systems and simplify training and use. All rebreathers used during PADI courses must be third-party tested and manufacturers must ensure they meet a comprehensive list of requirements. In this entry-level rebreather program you will learn to use Type R rebreathers to a maximum of 18 meters/60 feet within no decompression limits. PADI Open Water Diver and PADI Enriched Air Diver certifications (or qualifying certifications from a recognized organization). This course expands on the basic knowledge you have already acquired and provides training to a maximum of 30 meters/98 feet (40 meters/130 feet if you have a PADI Deep Diver certification), including carrying a bailout cylinder. The Poseidon MKVI is the world’s first rebreather for recreational divers. It’s a fully-­closed, fully ­automated unit that will make you see diving in a different light. The system comprises a breathing loop (mouthpiece, hoses, counter lungs and backpack) with associated electronics module, and two independent gas cylinders. One contains 100% compressed oxygen which is added to the breathing loop as the diver consumes it. The second cylinder typically contains compressed air “diluent” to compensate for compression in the breathing loop as the diver goes deeper. It’s also a back­up system, containing enough oxygen for the diver to breathe directly in an emergency. No decompression stops and Silent operation makes you part of the environment; not just a visitor. The MKVI, the first true technological breakthrough in decades, is a game­-changer. Rebreather Class Schedule and Cost. The above classes will be held in Key Largo Florida. Transprotation and housing not included in price. If you need housing and transportation please advise us when signing up for the class. Fine-tune your underwater observation skills and learn to use your compass more accurately. You’ll learn the tools of the trade, including navigation using natural clues and by following compass headings. You will practice these skills during your three dives. Besides your basic scuba equipment, you’ll need a compass and underwater slate. Your PADI Instructor may suggest other gear to help you stay oriented, such as marker buoys or lines and reels. Stop by Blu Water Scuba today to enroll in the course and get a PADI Underwater Navigator Crew-Pak that includes your manual and video. By studying before class, you’ll be better prepared to start practicing your navigational skills when you meet with your PADI Instructor. Capture the sights, sounds, and the dynamic motion of the underwater world as a videographer. Cover the fundamentals and create interesting, entertaining video worth watching again and again. If you’re a PADI (Junior) Open Water Diver who is at least 10 years old, you can enroll in the PADI Underwater Videographer Specialty course. Of course you’ll use an underwater video camera and need your basic scuba equipment. To edit your video, you’ll need access to video editing equipment, which usually includes a computer with editing software. Ask our staff about what additional equipment you may need for getting high-quality underwater video while diving locally. Visit our retail center to discuss your training options. You’ve been a scuba diver for over six months, you may have already attained the Master Scuba Diver rating, and treated yourself to several fun-filled scuba diving vacations —but something’s missing. Then one day you realize that you not only want to participate in scuba diving, but you want to teach the sport you have come to love. To find out how to get started, contact us today to discuss your goals and course schedule. You may be able to earn college credit for the PADI Divemaster course. performing all 24 dive skills listed on the Skill Evaluation. You can purchase all the equipment needed for the course here at our store. If you are looking to go pro, please contact us and sign-up today! Browse the most popular instructor specialties. You will need to equip yourself with all the basic scuba gear, some scuba accessories and depending on which specialties you teach, you’ll need other specialty diving gear such as dive lights or underwater photography equipment. You can find most everything in our dive shop. or have completed an IDC or Open Water Scuba Instructor (OWSI) program within the past 12 month. You will need to equip yourself with all the basic scuba gear as well as some scuba accessories. 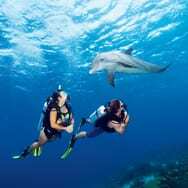 It is highly recommended and expected that, as a diver of this level, you own your own scuba equipment. We can help you select the right gear here in our store. Many of dive center or resort management positions require this level of Instructor experience and training, making this an important step if you are considering a career in Dive Center or you want to open a dive shop or resort. If you are looking to do IDC Staff Instructor, please contact us and sign-up today! Be recognized as one of the elite dive educators – PADI Master Instructor. PADI Master Instructors embody the essence of a true dive professional having demonstrated a thorough understanding of the PADI System of diver education, and put it into practice by training 150 or more PADI Divers. They are dive industry leaders who help to shape the development of future dive courses. Most people would agree that cave diving is a form of technical diving. Cave diving developed in the late 1960s and 1970s, developing into a discipline largely like it is today by the mid 1980s. In the early 1990s, several groups of divers around the world began experimenting with technologies for deep diving (beyond recreational limits) to explore both caves and wrecks. These communities united and emerged as “technical diving” or “tec diving” with the publication of aqua Corps (no longer in print), which dedicated itself to this type of diving. Since then, tec diving continues to develop both in scope and in its technologies. Tec diving not only has more risk, but it requires significantly more effort, discipline and equipment. It’s not for everyone, and you can be an accomplished, avid top-notch diver your entire life without making a tec dive. That said, there’s a cadre of individuals who want to visit places underwater that relatively few people can. Many spectacular, untouched wrecks lie at depths well below 40 meters/130 feet. Deep reefs have organisms you don’t find in the shallows. Some people enjoy the challenge and focus tec diving requires. Still others love being involved with cutting edge technologies. These reasons make tec diving rewarding. 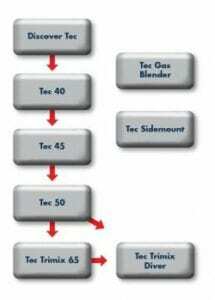 The Tec Diver course is an integrated sequence of three sub courses: Tec 40, Tec45 and Tec 50. You can complete them continuously, or you can complete each level separately with a time span between them. This gives you learning efficiency, instructional integrity and schedule flexibility. Consists of three knowledge development sections, three practical application sessions and four training dives. Designed for the diver transitioning from recreational diving to technical diving. Note that qualifying certifications from other diver training organizations may apply. Stop in our retail center to purchase your Tec Deep Diver Crew-Pak that includes a PADI Tec Deep Diver Manual, which you can start reading right away. You’ll study independently before meeting with your PADI Tec Deep Instructor. You can also get an Equipment Set-up and Key Skills video, which is a great tool to help you practice skills between your tec diving adventures. You'll continue to use the Tec Deep Diver Crew-Pak through your Tec 45 and Tec 50 courses. Part 2 of the PADI Tec Deep Diver program. Extend your depth limit to 45 metres/145 ft. Learn to plan & execute repetitive decompression dives using a single stage/decompression cylinder. Stop in our retail center to purchase, if you don’t already have one, a Tec Deep Diver Crew-Pak that includes a PADI Tec Deep Diver Manual, which you’ll use for self-study. The Equipment Set-up and Key Skills video is an optional tool to help you practice skills between your tec diving adventures. You'll continue to use the Tec Deep Diver Crew-Pak through your Tec 50 course. Stop in our retail center to purchase, if you don’t already have one, your Crew-Pak that includes a PADI Tec Trimix Diver Manual, which you can start reading right away. You also receive a deep stop calculation table, trimix decal and emergency procedures slate as part of your pak. This course turns experienced tec divers into extreme divers. During this course, you'll make dives as deep as 90 metres/300 feet, use multigas trimix computers, & handle up to 4 stage/deco cylinders. Your Tec Trimix Diver Crew-Pak includes a PADI Tec Trimix Diver Manual, which you can start reading right away. Stop by our retail center to purchase your materials, which also include a deep stop calculation table, trimix decal and emergency procedures slate. Get the PADI Sidemount Diver and Tec Sidemount Diver Manual from our retail center and start studying immediately. If you have a recreational sidemount diver certification, you’ll focus on Chapters Two and Three, if not, you'll read the entire manual. Being a gas blender is a key job at a busy PADI Dive Center or Resort. This course teaches you how to blend enriched air nitrox and helium-based gases using one or more blending methods. You can purchase your PADI Gas Blender Manual to start your independent study by visiting our retail center. Help meet the demand for qualified gas blenders. As a Tec Gas Blender Instructor, you will understand the differences between gases and be able to explain critical information to others. Enriched air, trimix and rebreather diving just can’t happen without the right gas mixes. Not only does a dive shop need the right blending equipment, but it also needs qualified gas blenders. As a Tec Gas Blender Instructor, you can help meet the demand for gas blenders by offering this important training – the Tec Gas Blender course. Tec Deep Instructors contribute to deep exploration by training the next generation of tec divers. Certifications from other diver training organizations may apply - ask your Tec Instructor Trainer. As a Tec Trimix Instructor you can teach the full range of deep open-circuit tec diving courses, including Tec Trimix 65 and Tec Trimix Diver. It's a respected certification only a few achieve.